This impressive 6-bedroom villa resort enjoys a Thai design with tropical Asian flair. 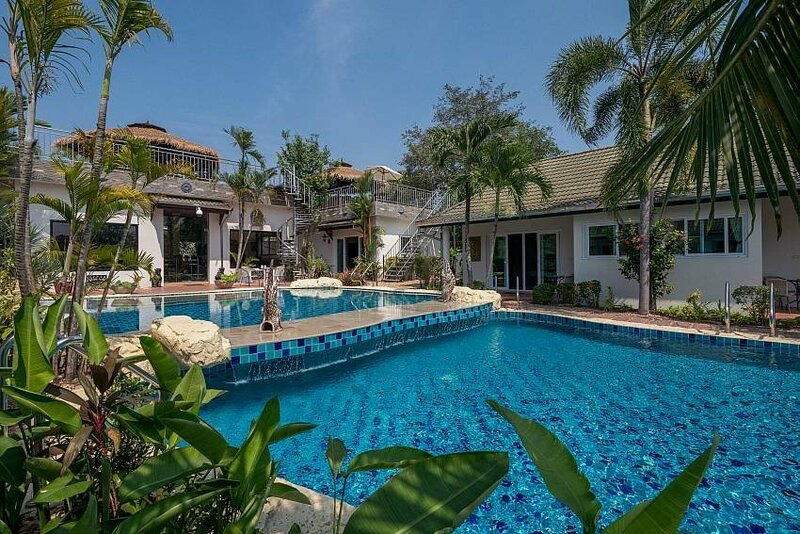 If you are travelling to Pattaya with a large family or group of friends, this 6-bedroom luxury villa sleeps up to 12-people and is located in a mesmeric countryside location at Huay Yai, just a short drive to Pattaya and Jomtien. Situated near to the Phoenix Gold Golf Club, if you are a golf lover or just want a peaceful yet luxury villa for your stay, you have just struck gold! The villa has a massive garden area with a gargantuan private swimming pool with a shallow kid’s pool that is bigger than some main pools. The pool is flanked by lots of seated areas and a stunning raised terrace area that is ideal for BBQ parties and enjoying social evenings with your travelling friends. The massive open living space combines a lounge and a fully-equipped Western-style kitchen that comes with lots of appliances such as an oven and a breakfast bar for informal dining. The lounge has a luxury leather sofa and large flat-screen TV that has international channels. There is also a dining area with two wooden dining tables big enough for everyone. The 6-bedrooms all have king-size double beds, ensuite bathrooms and wooden wardrobes. The bedrooms sleep up to 12 people. The villa is situated in a countryside area that is under a 10-minute drive to Jomtien Beach and closer to 20-minutes to Pattaya Beach Road. Within a 10-minute drive you can find lots of international restaurants, shopping centers and tourist attractions.